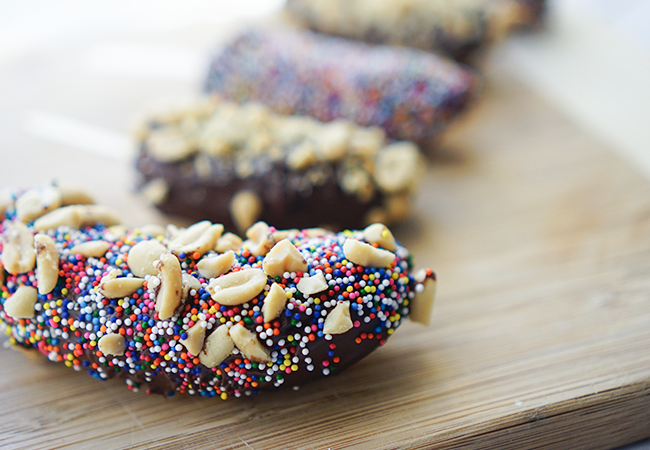 Assorted toppings of your choosing: we recommend sprinkles, nuts, chocolate chips. Peel the bananas and cut them in half. Place a wooden stick in the cut end of each banana. Line a baking sheet with parchment paper, and place the bananas on the baking sheet and freeze for 1 hour. Melt the chocolate in the microwave in 30-second increments, and stir until smooth. Use a spoon to dip the bananas in chocolate and add your toppings to enjoy!